1. I am guessing if it was a vehicle we’ve already seen he might have worded it a little differently. That leads viagra to the boat, copter or batgirl cycle. 2. And we’ve already seen that HW was quick to do the Batcycle which is NOT a Barris design so they only have to pay licensing to TW for that. 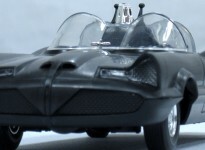 Which still leaves the copter, batgirl cycle and boat which are all non-barris owned designs. 3. AND my suspicion that they either directly used or at least piggy-backed on to the Polar Lights patterns for the batcycle then leads me to think the copter and the batgirl bike are out. Okay maybe its me, but this post says it will have wheels? ummm ‘cuse me but ummm the batboat doesnt have wheels unless someone is going to add a trailer… pretty cool though, Im IN for 3 of them! we need the Camo Tumbler and the 1990 Missle car too! 1:50th scale figures too?? Where did the picture come from? I went to Comic Con NYC in April 2008, no HWs Batboat there, unless I missed it or they’re talking about Comic Con 2008 in the west of U.S.A.
Kevin – I created the picture in photoshop. Spartanwolf – It’s the San Diego Con they’re talking about. That’s the BIG con. would it be sell on amazon?? ?